It’s Cold Soup Week at The Takeout, where we celebrate the pleasures of chilled soups during the dog days of summer. Foods that become lifelong obsessions, like all obsessions, often emerge from a single memory. Here’s one: The summer before junior year in college. The last week of two months backpacking across Europe. Some tapas bar in Madrid. A chilled gazpacho in the sweltering heat. Tomatoes, cucumbers, bell peppers, garlic, and smoked paprika, blended into an orange color I’ve never before seen in soup form. One sip, and the word that came to mind was zesty. It was vegetable soup but with the refreshing qualities of a frosty beer. Forget grilled burgers and sweet corn; this was the taste of summer. I’ve thought about that bowl of gazpacho for years, mostly about the miracle of alchemy—that what’s essentially cold vegetable purée could taste so wonderful, like Spain in sippable form. 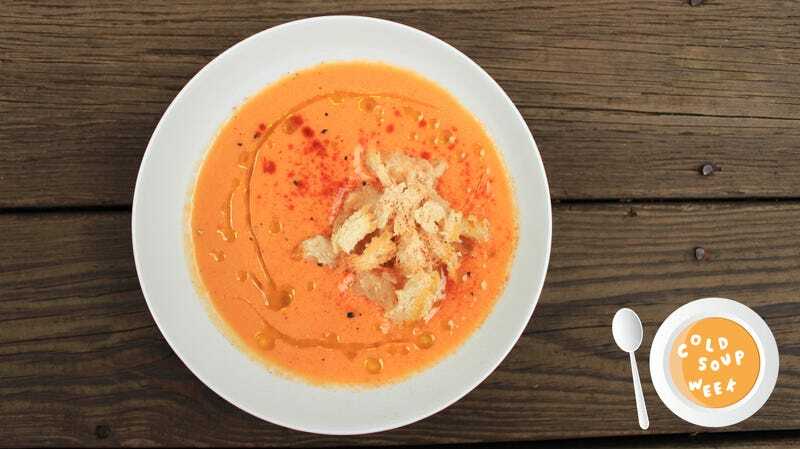 The word “gazpacho” has since been misappropriated to include fruits like watermelon and strawberries (which you may also find in Spain), but to me the savory Andalusian version—the original—remains king. I’ve tested many recipes, and the version below is exactly as I remember from all those summers ago. Garbage tomatoes will yield garbage gazpacho. Obvious, right? The problem is most supermarket tomatoes are devoid of taste and flavor (read Barry Estabrook’s Tomatoland: How Modern Industrial Agriculture Destroyed Our Most Alluring Fruit for more insight), and good heirloom tomatoes are only available for a short window. (You also shouldn’t be storing tomatoes in the fridge.) Fortunately, for many reading this, we’re now entering into that six-week window, so head to your farmers market and find three pounds of ripe tomatoes. I like mixing in a few yellow heirlooms, which tend to be less acidic than their red counterparts. First, we need to remove the tomato skin, and we’ll employ an age-old method: Using a paring knife, score an X at the underside of the tomato. Gently place the tomatoes into a pot of simmering water and let them sit for a minute, until the skin begins to peel back. Remove the tomatoes and place them into a bowl of iced water. The skin should now be easy to peel. Dice the tomatoes into one-inch chunks, and place them into a separate bowl. There will be a lot of tomato juice pooling on the cutting board, so be sure to scrape this manna into the bowl. In the meantime, remove the crust from three to four slices of bread, place in a small bowl, and soak the crumb (the white spongy middle) with water so it gets soggy. Take two green bell peppers and cut one in half as well. Save one half for a fajita. With the other one-and-a-half peppers, dice into roughly the same one-inch chunks as the cucumber. Place the diced cucumber and green pepper—along with five cloves of smashed garlic (using a press or knife—again, it’ll go into the blender)—into the bowl with the tomatoes. Now it’s time to blend everything in a food processor or blender (I’ve also done this in small batches with a Magic Bullet). Here’s where you test your cooking mettle, because you’ll be tasting and adjusting (like professional chefs do) as you go. Broadly speaking, you’ll be blending all the vegetables and bread together, along with a cup of olive oil, cracked pepper, a tablespoon of salt, and three tablespoons of sherry vinegar. But perhaps your tomatoes are more tart than sweet. Perhaps you bought really large green peppers and that throws the flavor balance in that direction. Perhaps you’re using a sharp and peppery olive oil instead of one that’s fruitier and lighter. We’re dealing with variables and the whims of nature here, which is why you should blend in small batches, taste, and adjust. As always, underseason (I’d start with 3/4 cup olive oil, two tablespoons of sherry vinegar, and two teaspoons of salt), because it’s easier to add more than take out. You’ll want to blend everything as smoothly as possible. Still, you’ll be left with puréed solids, so after it’s blended, ladle this into a fine-mesh strainer and push it through using the ladle to extract as much gazpacho liquid as possible. This liquid is the gold you’ll be enjoying shortly. You’ll be left with a strainer full of vegetable solids, which I’ll throw back into the blender with a splash of water and olive oil to get even more gazpacho out. The last step is the toughest part: Let the gazpacho liquid chill in the fridge for a few hours. The dish should be served chilled, not room temperature, not a touch cool. Serve in a glass or a bowl. Finish with smoked paprika (this is essential), croutons, a splash of olive oil, and if you like, very finely diced hard-boiled eggs or green bell pepper. Enjoy summer.